The Yellow Vest movement is indeed spreading worldwide. In France, they are out destroying speed cameras. Most Americans are familiar only with the red light cameras that cities have been forced to take down for they are unconstitutional. That is why you did not get points for the violation, just penalties. In Europe, the speed cameras are outrageous. When I was living in Switzerland for a few months, boy did I get tickets galore. You suddenly find out that you get a ticket for just 1 km over the speed limit. In the States, a cop will not give you a ticket until you are more than 10 miles an hour over the limit. Your speedometer can be off as well as theirs. In Europe, there is no such recognition. In Rome, just don’t bother even renting a car. All you will get are countless tickets as they change the speed limits at different times during the day and they will take a year to send you a ticket without any description of what the fine is even for. In Europe, these are just an excuse to impose more forms of taxes. 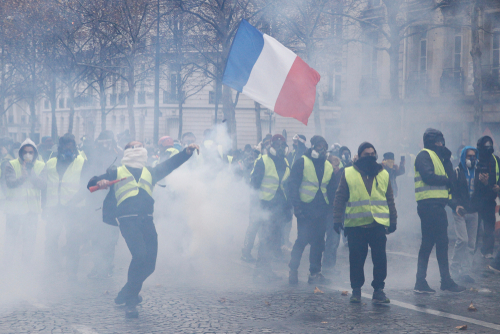 As government becomes ever increasingly desperate for money to pay their own pensions, we are headed into a clash that will be civil unrest on a global scale that will begin to rise much more dramatically after the turn in the ECN come January 2020. The polls show that the Yellow Vests Movement in France has 70% of the population behind them.